The people of Christleton in England can rest well tonight, knowing that they have been protected from a grave threat to their health and safety. 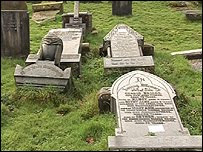 Recently, the Parochial Church Council of St. James Church ordered that all gravestones in the church cemetery be examined for safety. As a result, 181 gravestones were laid down flat, thus eliminating the risk of, well, we aren't sure. Apparently, they are afraid that someone might climb on a gravestone and cause it to fall, thus terminally hurting himself. The gravestones in question are not all crumbling historic relics. Some are relatively new stones that don't meet the standards of the paranoid persons committee. Relatives and friends of the cemetery residents plan to take legal action. Apparently, they are ungrateful for the protection that they have received. addendum: research shows that people who are not allowed to climb on gravestones generally are not hurt by them.